I’m on hiatus! The nice thing about working on tv shows is that you get a nice, proper bit of time off for the holidays. So, with my Christmas shopping all done and my apartment all freshly cleaned and organized… it’s about time I catch up on some VERY BELATED veggie burger posts! 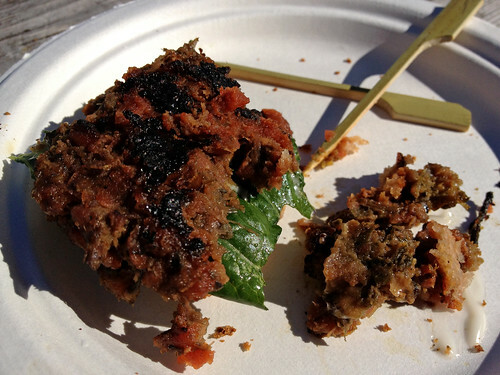 This one is from back in October – my friend Sasha and I went to Williamsburg to check out the foodie spectacular known as Smorgasburg. As I usually do, I immediately hunted down the local veggie burger option… and there was Chickpea & Olive, with vegan SLIDERS! Made with beets, barley, mushrooms, and lentils, these sliders were a bit pricey as far as tiny burgers go, but looked so mouth-watering that I couldn’t resist. The staff making and selling the sliders (and other delicious-looking vegan food) were very friendly, and chatted with me while they cooked. Apparently a lot of people are mislead by their name, and end up disappointed that they can’t order, literally, chickpeas and olives. 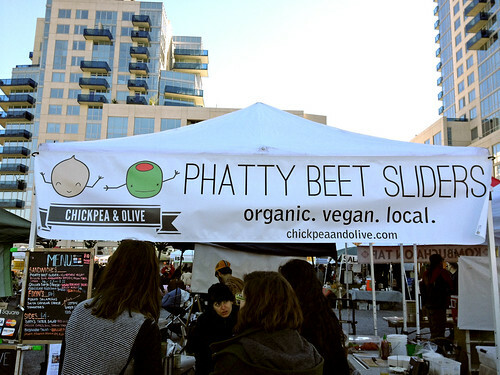 I think the words “Phatty Beet Slider” caught my eye before their name, but I’m biased. I took my sliders and met up with my friends on a picnic bench in the park next to the Smorgasburg area (while it may be a foodie’s dream come true to have so many food vendors all in one place, once it starts getting crowded, it’s as claustrophobic and annoying as Times Square! Go early in the day if you can). 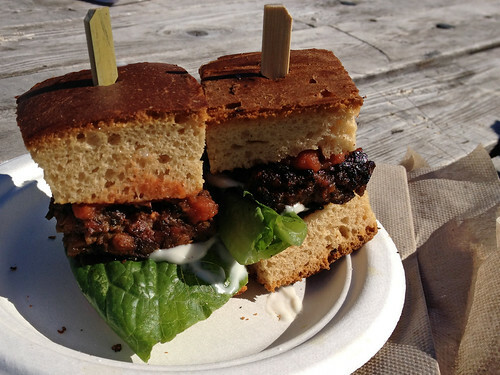 Smorgasburg is over for the season now, but hopefully Chickpea and Olive will be back serving their tasty sliders there next year! check website for current location it looks like they will be at the Vegan Shop-Up tomorrow, December 22nd, but not serving veggie burgers. I've been seeing Chickpea and Olive everywhere, but I've usually just come from eating (! ), so I've yet to try. Hearing good things so far; happy also to have your seal of approval!